In the Awards issue of Gramophone, on sale from September 14, we bring you a full report of the biggest classical event of the year – the Gramophone Awards 2018. We name the 10 category winners, and also reveal the recipients of our highly anticipated special awards, including Orchestra of the Year – the one category voted for by the public – and Recording of the Year. In other features, Jed Distler throws himself into the unique sound world of Busoni’s solo-piano transcription of Bach’s Chaconne in ‘Collection’, Richard Whitehouse explores Pascal Dusapin’s unpredictable musical idiom in ‘Contemporary Composers’, and Editor-in-Chief James Jolly travels to Estonia to speak to Paavo Järvi about the challenges of conducting Brahms’s Haydn Variations in ‘Musician and the Score’. 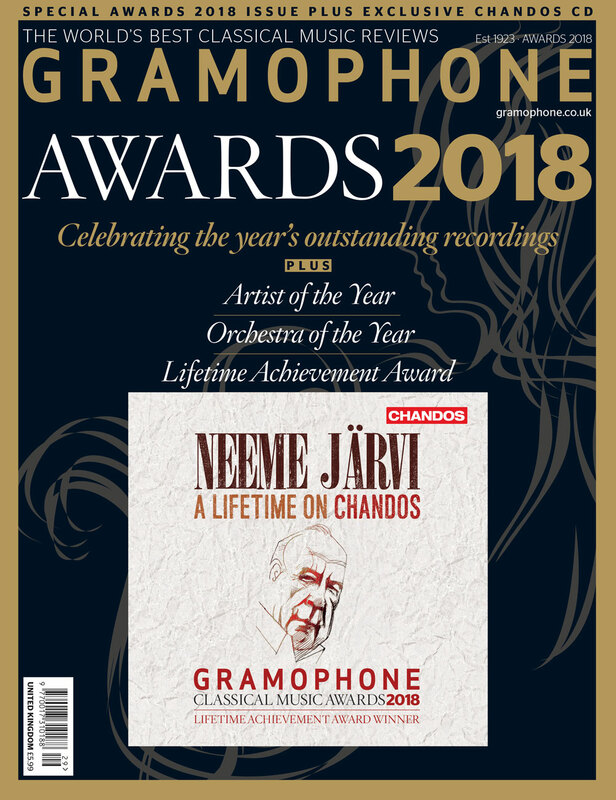 The 2018 Gramophone Awards issue comes with a free CD, 'Neeme Järvi – A lifetime on Chandos', featuring some of the finest moments on record by this year's Lifetime Achievement Award-winner, including works by Tchaikovsky, Smetana, Rachmaninov and Dvořák, with the Philharmonia Orchestra, Royal Scottish National Orchestra, Bergen Philharmonic Orchestra, Orchestre de la Suisse Romande, Estonian National Symphony Orchestra and the Detroit Symphony Orchestra.